The Comfort Deluxe offers just that... Deluxe Comfort at a fraction of the price. Featuring Copper PTC heating elements, the Comfort Deluxe holds heat better than its aluminum counter parts meaning you can heat a room in your home or office cheaper. Simply place the heater in the room you use most and enjoy long lasting heat. Better yet, the copper elements have natural antimicrobial properties and will not reduce the oxygen or humidity levels in your home. 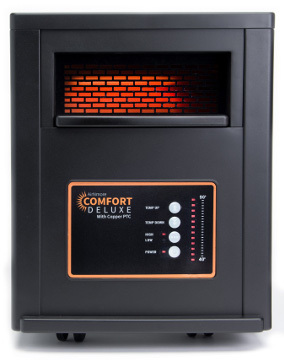 Unlike space heaters of the past, the Comfort Deluxe remains cool to the touch while in operation and features Dual High Limit and Tip-Over Sensors making this unit one of the safest space heaters around. Combining long lasting heat with Safety & Efficiency will give you the peace of mind you need to enjoy the savings you recieve on your heating bill every month.